The son of a Manhattan woman found dead in a garbage bag in New Jersey told his girlfriend he’d killed his mother — and said that it took her “a while to die,” prosecutors say. 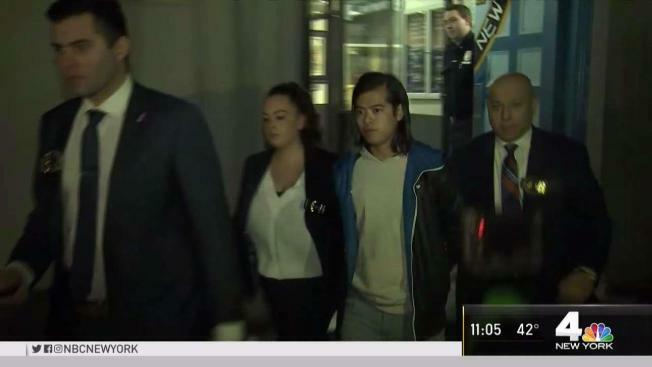 Jared Eng, 22, his girlfriend Caitlyn O’Rourke, 21, and a third woman, Jennifer Lopez, 18, were charged with concealing a corpse after the body of Eng’s mother, Paula Chin, was found at a home she owned in Morristown, New Jersey, prosecutors said. At his perp walk on Wednesday, Eng denied killing his mother. O’Rourke, however, told detectives Eng called her and said he’d killed Chin, according to the complaint. Eng "admitted [to O'Rourke] that it took Ms. Chin a while to die and that they subsequently transported [Chin's] body to New Jersey,” the complaint says. O’Rourke told detectives she, Eng and Lopez drove to Chin’s New Jersey home on Feb. 1, where Chin's body was stuffed in a garbage bag. The three of them then tossed Chin’s body into a garbage bin outside the home, O’Rourke told detectives. O’Rourke and her co-defendants brought clothes from Chin’s Manhattan apartment to the New Jersey home, where she and Eng washed them, she told detectives, according to the complaint. When police searched the New Jersey home, they found duct tape, bloody rubber gloves in the garbage and blood stains on the floor inside the garage, the complaint says. A search of Chin’s car on Tuesday turned up the same duct tape, the complaint says. Police also found blood on the carpet and clothes that belonged to Chin. In a conversation found on O’Rourke’s cell phone, Lopez alluded to something being “all clean,” adding that “the hardest part was backing up the car,” the complaint says. Surveillance video taken outside Chin’s Manhattan apartment on Jan. 31 shows Lopez getting in and out of Chin’s car, and another, unidentified person carrying a “duffle bag-like container” out of the building and putting it in the trunk, according to the complaint. Eng admitted to detectives that he and Lopez drove his mother’s car to New Jersey twice between Jan. 31 and Feb. 1, the complaint says. All three of the defendants have been charged with tampering with physical evidence and concealing a human corpse, prosecutors said. None of them have been charged with Chin’s murder. People who work on the block said Chin was the landlord at her building in Manhattan, and at least one of her sons also lived there. Public city records confirmed she owned the building at the address, along with Philip Eng.